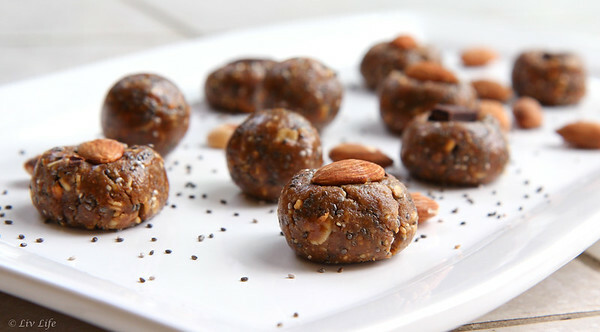 Seriously irresistible, you don't need to feel guilty about tossing a few of these little bites into your bag for an energy burst and protein boost. 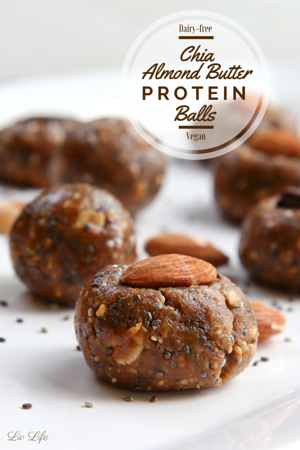 Filled with super-foods, fiber and vitamins, they make a fabulous post-gym snack or a mid-afternoon pick-me-up. Place almond butter and maple syrup into a medium sized bowl and mix with a sturdy wooden spoon. Add Protein Powder, oats, flax, chia and vanilla extract, and stir again until completely incorporated. Add oat flour 1 Tablespoon at a time to thicken to a thick dough. Using clean hand, roll the dough into desired sized balls (we liked small bite-sized ones) and if desired press a whole almond or a chocolate chip or chunk into the ball. Liv Life Note: It's been mentioned that a handful of chocolate chips mixed into the dough might be another awesome addition! Liv Life Note 2: While I'm not a doctor, we've had experience with narcotic pain medications and constipation. I've been told that it's a rare, but my husband ended up with constipation so bad it resulted in a bowel obstruction and emergency surgery followed by a 6 day hospital stay. Please, please follow instructions when taking these medications and be proactive to avoid constipation issues. These are my kinda snack! They sound terrific. Perfect for an afternoon outing! Lol! I love your story and your dad sounds amazing, I hope he is well on the way to recovery! I'm sure these Awesome Balls helped him bounce back :). 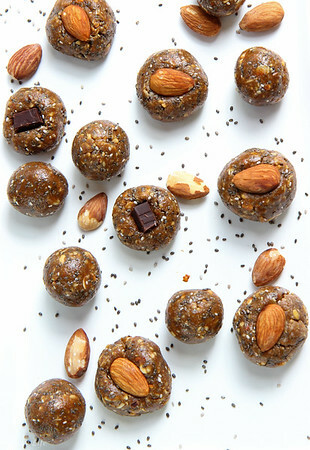 These sound yummy and I like that I actually have all of the ingredients in my cupboard!! So healthy and sooooo yummy!! Love these! Dear Kim - these look so delicious! Your dad is one lucky guy to have you cooking and concocting in the kitchen for him. And we all get to benefit! Hope he continues with a stellar recovery. Yum Kim, these look great and it sounds like everyone who tried them loved them. That's an accomplishment when you're dealing with both teenagers and elderly! Such a funny story too! Being a former nurse, I love it!